Product Description The Koeherl K24880 Microscale Continuously Closed Cup Flash Point Analyzer is widely used in the flash point measurement of petroleum products,transformer oil, turbine oil, paint, perfumes, wood preservative oil, aromatic oil, animal and vegetable oil, pesticide emulsifier, high viscosity materials, plasticizers and other substances. In addition, Pensky-Martens closed cup method and rapid equilibrium closed cup method are feasible on this instrument by changing parameters. The correlation between these is very well. 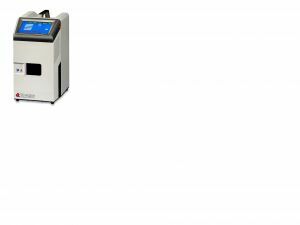 ASTM D6450 This test method covers the determination of the flash point of fuel oils, lube oils, solvents, and other liquids by a continuously closed cup tester. The measurement is made on a test specimen of 1 mL. This test method utilizes a closed but unsealed cup with air injected into the test chamber and is suitable for testing samples with a flash point from 10 °C to 250 °C. ASTM D7094 This test method covers the determination of the flash point of fuels including diesel/biodiesel blends, lube oils, solvents, and other liquids by a continuously closed cup tester utilizing a specimen size of 2 mL, cup size of 7 mL, with a heating rate of 2.5 °C per minute. This test method utilizes a closed but unsealed cup with air injected into the test chamber and is suitable for testing samples with a flash point from 35 °C to 225 °C.